following the Liberal Victory Sweep? 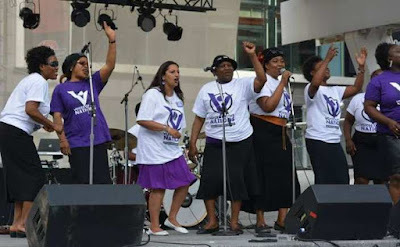 Toronto bans music festival from city square over Christian songs TORONTO, October 29, 2015 (LifeSiteNews) -- The City of Toronto is refusing to grant a Christian group a permit to use a prominent downtown square for its annual musical festival next year, because the city has decided that singing the name of Jesus in the public venue contravenes city policy against “proselytizing.” Voices of the Nations (VON) has been using city property since 2006 for an annual “multi denominational” event in which it celebrates Christianity through live music and dance. It has been using the Yonge-Dundas Square without issue for the past five years. This year’s August event attracted 19 different performance acts, including children’s choirs and popular Christian bands, where well-known ‘praise-and-worship’ songs such as “Days Of Elijah” are performed. When VON’s Events Coordinator Leye Oyelani contacted the Square’s Manager of Events Natalie Belman last week by phone to apply for next year’s permit, he was told that a permit would not be issued and to look for a venue elsewhere. “If you’re praising Jesus, ‘praise the Lord,’ and ‘there’s no God like Jehovah,’ that type of thing, that’s proselytizing,” she said. ‘Blatant discrimination’. Rev. David Lynn, street preacher and founder of Christian Positive Space & Stop Bullying Christians Now, called the refusal to grant the permit “blatant discrimination” against Christians. “discriminating against a Christian group for singing songs in public about Jesus. It’s almost as if we are nearing the last days where the Bible tells us that Christians will be persecuted for their faith. This is only the tip of the iceberg and I believe that things will only get worse, but we know that Jesus has already won the war,” he told LifeSiteNews.